In the summer of 1922 a biplane whirred above an amazed crowd gathered in a New York airfield. The pilot, an African-Chocktaw-American woman named Bessie Coleman, made daring figure-eight loops and perilous barrel rolls, smoke swirling across the sky. This was not expected behavior in the 1920s. Men and women of color were not only seen as people who couldn’t fly—they were not supposed to fly. For Bessie Coleman, this was not a barrier. It was a challenge. Born in Atlanta, Texas, Coleman walked miles to school, where she soon revealed herself to be smart—especially in math. Her mother taught her about strong black figures, and recognizing her intelligence, allowing her to keep her earnings as a laundress so she could finance her education past the eighth grade. She attended the Colored Agricultural and Normal University, now called Langston University, until her funds ran out. Despite this setback, she continued to work and save money until she was able to move to Chicago to join her brothers in 1915. It’s not entirely certain when Coleman first decided she wanted to fly planes; but the possibility began to seem more real when she worked as a manicurist in the White Sox Barber Shop in Chicago. Her brother, a veteran of the First World War, told her teasing stories about France, where women were allowed to fly planes. She applied to schools in the United States, but no school would take on a woman of color as a student. France was just the key Coleman needed to begin her next step—she saved up for French classes and learned the language; and on some added encouragement from Robert Abbott, owner of the Chicago Defender, she left. In 1921, Coleman earned an internationally respected license to fly from the Federation Aeronautique Internationale—two years before Amelia Earhart received her own international license. Back in the United States, however, Coleman had to make a living. The commercial aviation division rejected her bids to work; a more popular career stunt flying called “barnstorming,” presented itself, but again, no one would train her to perform advanced aerial maneuvers in a plane. She made a return trip to Europe, and in 1922, after advanced intensive training in France and Germany, Coleman began a career flying stunts—multiple loops, spins, barrel rolls and dives across the sky for paying crowds. 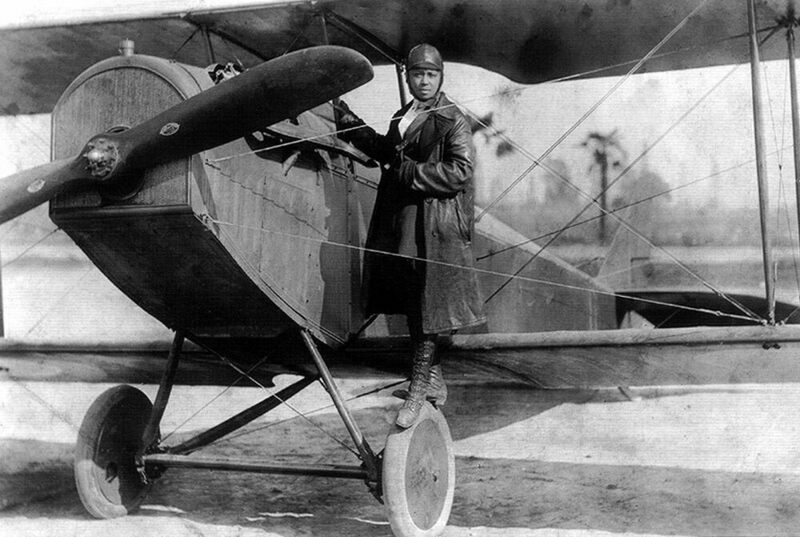 Despite criticism from the press for her daring, complex aerial maneuvers, and unabashedness, Coleman gained a following and quickly became a sensation in both black and white newspapers. Coleman was a brilliant self-promoter, but fame was only a piece of what she wanted to accomplish. In an interview with the black-owned newspaper Chicago Defender she revealed it felt like her duty to encourage flight for African Americans. For the next five years, Coleman was known as Queen Bess—the aviatrix who flew biplanes called “Jennys” and leftover aircraft from the World War I. But this was a small part of Coleman’s dreams—she meant to use her life as a leading example to the world of what women of color and people of color could accomplish. Starting in Houston, Texas and her hometown of Waxahachie, she traveled across the country to lecture audiences in churches, theaters and schools as an authority on aircraft flight while showing films of her work*, pointedly leading by example. At every turn, Coleman brought her standards to elevate noxious, racist situations. When black spectators in Waxahachie were told to use a segregated entrance, she leveraged her position against the show promoters to let everyone enter the same way. At the time, it was common for women to be offered film roles to further market themselves as they grew famous; but when Coleman found that her role in the movie Shadow and Sunshine required her to act as an offensive African-American trope, she left the contract and didn’t look back. Instead, she made deals with businessmen who wanted flying lessons, and would buy her airplanes in return. Amid her fame and steady influence on the American public, Coleman’s death was a tragic surprise. In 1926, on an exploratory flight to scout out a parachute jump location, her mechanic flew and lost control of the plane due to a wrench in the engine compartment. Coleman, unbuckled so she could easily scout the area, was thrown to her death from 3,500 feet in the air. Ten thousand people mourned at her coffin in Chicago that year, and black pilots from Chicago instituted an annual fly over of her grave. Her life inspired William Powell to found the Bessie Coleman Aero Club and created the first all-black air show, and in 1977 a group of African American women pilots established the Bessie Coleman Aviators Club. Bessie Coleman did not come to fly circles around spectators easily. In fact, she was warned; by U.S. culture, by race and gender barriers—she was given reasons not to pursue her goals, be outspoken, or use her talents to their fullest. In response, she dealt in possibilities; when she found herself up against the odds, she calculated her next move. Nearly 100 years later, it’s likely that Coleman would have liked to spread the famous message which is attributed to her, to those who persist today: refuse to take no for an answer. *Correction: This post previously stated that Coleman showed videos of her work. She showed films.